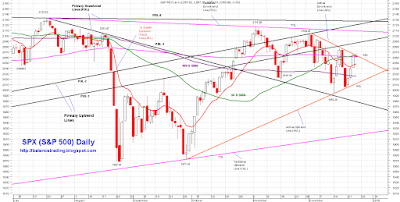 The three day strong rally in SPX was finally stopped by the stiff triple (50, 200 D-SMA and ADL) resistance on Thursday. SPX is now sandwiched by its active trend lines in a symmetric triangular formation. How SPX break out of its triangular formation will signal further move in that direction. 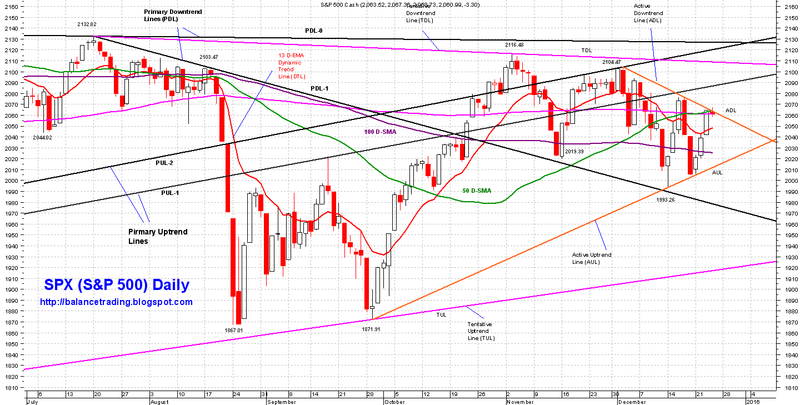 My guess is that SPX will eventually break to the downside and continue its selling. Chances are good that SPX sells off early next week to test its DTL around 2050, then there is a slight chance that SPX rallies for a false break out of its symmetric triangular formation before heading lower for a true break out. Price objective for the symmetric triangular formation is around SPX 1845 by mid to late January 2016. My plan is to open my second short position sometime this coming week.